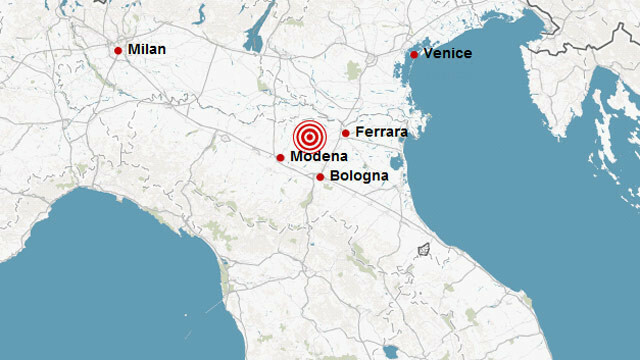 The 6.0-magnitude quake struck four kilometers (2.4 miles) outside Camposanto, northwest of Bologna. Rome (CNN) -- A strong earthquake struck northern Italy early Sunday, leaving at least seven people dead, authorities said. Two people were killed in a ceramic factory in Sant'Agostino di Ferrara, and one person died when a work shed collapsed in Ponte Rodoni di Bondeno, said Elisabetta Maffani, spokeswoman for Italy's civil protection agency. In addition, a woman in Bologna died of a heart attack during an evacuation; a Moroccan national died when the factory he was working in collapsed; and a sixth victim was found dead under rubble in Sant'Agostino, Maffani said. The seventh was located under a collapsed house, according to Alessio Bellodi of the civil protection branch in Bologna. At least 50 people were injured. Workers were searching through rubble for survivors in Sant'Agostino. In Sant'Agostino, the quake knocked down a church bell. Authorities were still assessing damage in the region, the civil protection office said. The agency said it anticipates reports of more injuries as rescue workers make their way to remote villages in the mountainous area. In January, the same area was struck by a 5.3-magnitude quake. In 2009, a 6.3-magnitude earthquake struck near the central Italian city of L'Aquila, killing more than 300 people and causing widespread destruction.